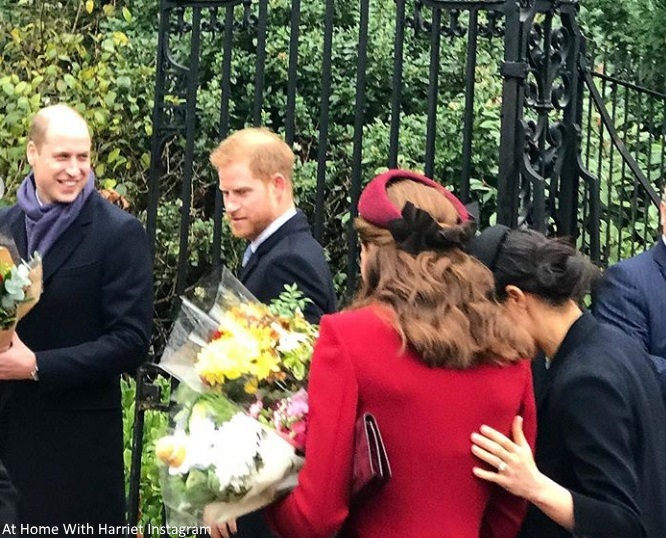 Mad About Meghan: Meghan in Victoria Beckham for Christmas Service at Sandringham! Meghan in Victoria Beckham for Christmas Service at Sandringham! Harry and Meghan celebrated their first Christmas together as a married couple with the Royal family at Sandringham. It's hard to believe how much has changed since Meghan joined the festivities for the first time last year. Twelve months later the couple had a beautiful wedding, undertook a slew of engagements, their first Commonwealth tour and of course news Baby Sussex is on the way. Next Christmas will be their first as parents, and the Sussexes will be settled in their new Windsor home Frogmore Cottage by then. The couple made the walk to St Mary's with William and Kate, as they did last year. Prince Charles led the group closely followed by William, Kate, Meghan and Harry. Prince Philip was notably absent, however the Palace said he is in "perfectly good health". The Duchess of Cornwall is unwell with a cold and was also unable to make the service. The Earl and Countess of Wessex with their children Louise and James. Autumn Phillips and Princess Beatrice followed closely by Princess Eugenie and Jack Brooksbank. The arrivals video below offers a good look at those in attendance. We saw an array of splendid photos of Meghan and Kate. 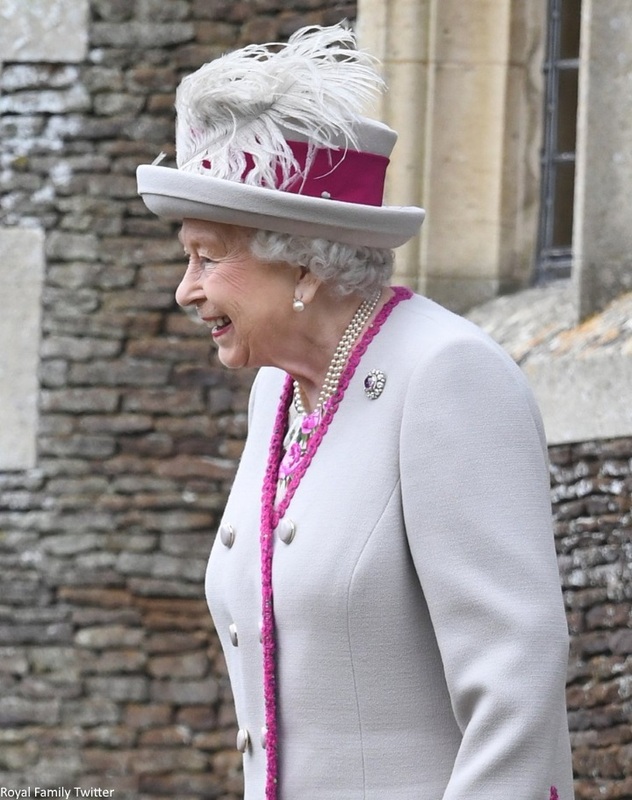 Her Majesty was resplendent in a soft dove grey coat with fuchsia pink trim. 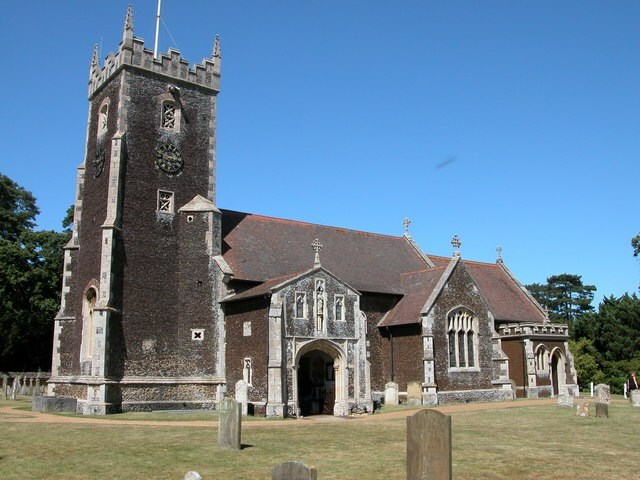 The parish church of St Mary Magdalene is of exceptional historical interest, with memorials to many members and relations of the Royal family from Queen Victoria onward. King George VI, Princess Diana and more recently Princess Charlotte were all baptised there. The Duke and Duchess departing church. You can see Meghan and Kate curtsying at 1.40 in this video. ....and this year was packed with special moments. 'Afterwards the young royals went on a brief walkabout and when Meghan saw 17-year-old Jessica holding up a small sign with her Instagram username on it, Jessica Scarlett, she instantly recognised it and gave her social media friend a hug. The teenager, from Peterborough, described the experience as "amazing" adding : "I started watching Suits, then I started following her on social media and then followed her acting and followed her humanitarian work, so I've been a fan of her for years. "There were a group of us girls on social media she became kind of close with and interacted a lot online." She said about the duchess, who closed down her social media accounts before her marriage to Harry: "This is the first time I've met her, she just said 'it's so lovely to meet you, incredible to finally see you' and she was asking how we all are and if we're still talking and supporting each other." A delighted Jess shared this tweet afterwards. The meeting reminded me of a moment in New Zealand where Meghan reunited with a young woman she supported on Instagram. It's great to learn how she used her reach on social media to offer encouragement to young women. When asked about Baby Sussex, Meghan said: "We're nearly there." There's additional footage in this video filmed by a well-wisher. Amidst a very difficult month of headlines, there was no doubt in my mind we would see a united front and photos of the Cambridges and Sussexes arriving together as they did last year. An onlooker captured this moment as they returned to the 'big house'. Watch a video here. Moving on to a look at what Meghan wore for the service. 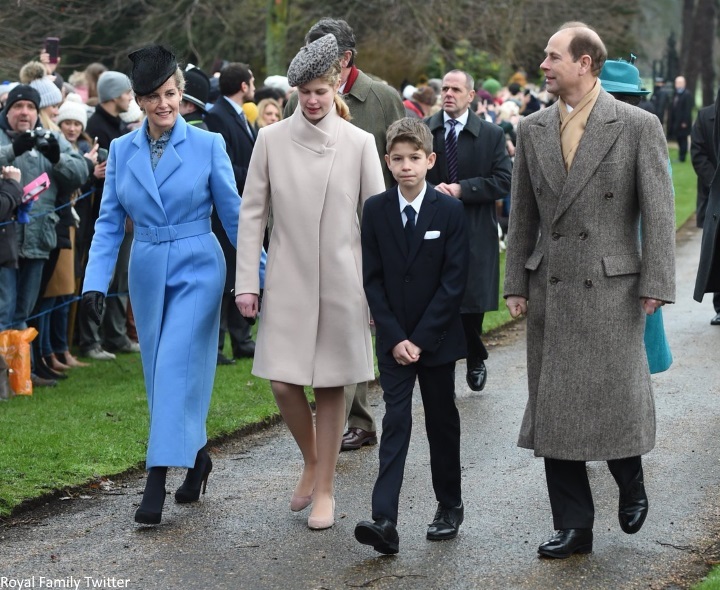 The Duchess wore the Victoria Beckham Tailored Slim Coat. 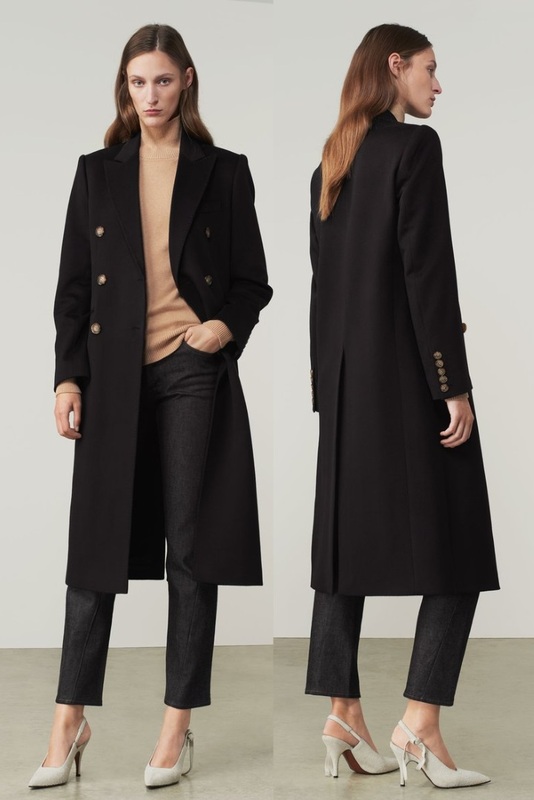 The $3,085 piece is described: "This is a tailored coat inspired by classic men’s outerwear, impeccably tailored for a slim fit, accentuating the silhouette of the body. Cut from super soft, deep navy cashmere, it features a wide lapel and a central back vent for movement. Made in Italy and finished with luxurious horn buttons and a silky navy lining, a wardrobe staple for the cooler seasons." It is thought Meghan's navy v-neck midi dress could be a custom Beckham piece. 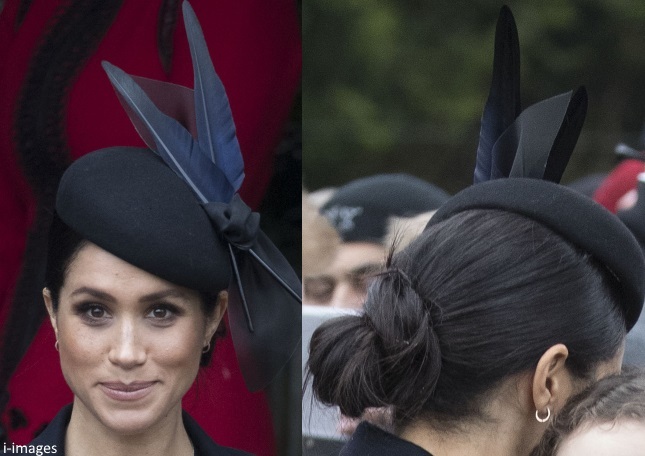 Heaven noted Meghan wore a new hat by British milliner Awon Golding. The wool felt Vika pillbox hat features a crinoline bow and dipped goose feathers. 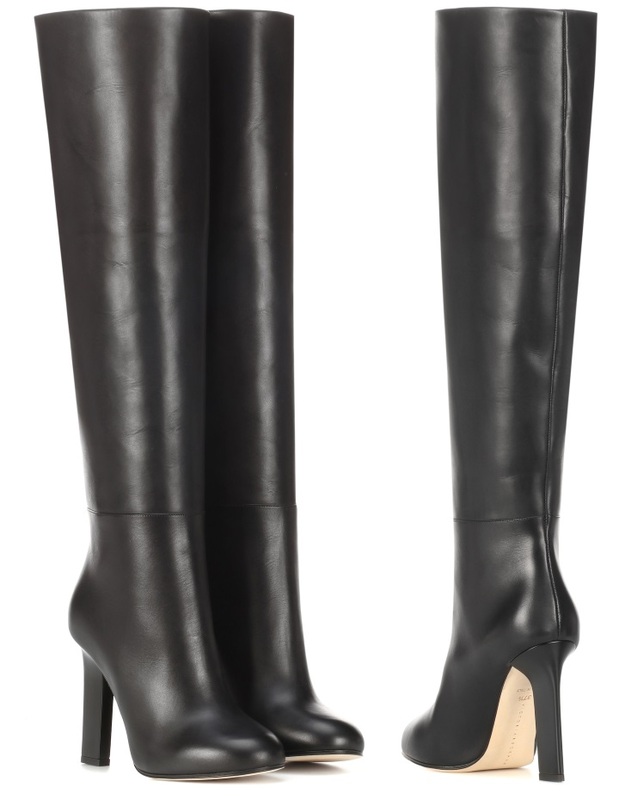 Meghan's boots are by Victoria Beckham. Described as: "Make an elegant impression in Victoria Beckham's towering black leather boots from the label's Pre-Fall '18 collection. This minimalist design has been crafted with maximum impact as the sleek rounded-toe silhouette is set on a high block heel". They retail for $1,200 at My Theresa. 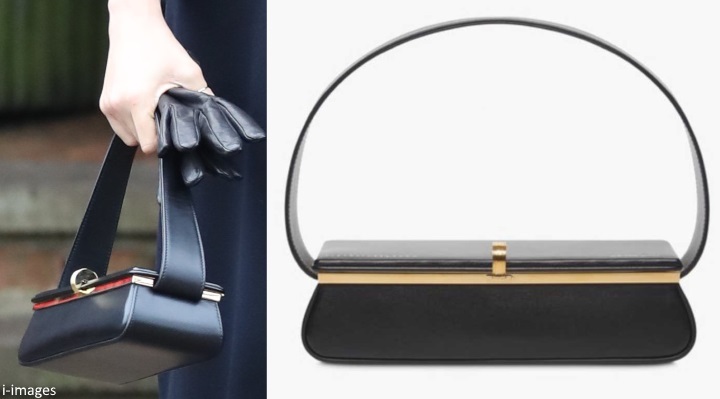 And Meghan's bag is the sold out Victoria Beckham Powder Box style. 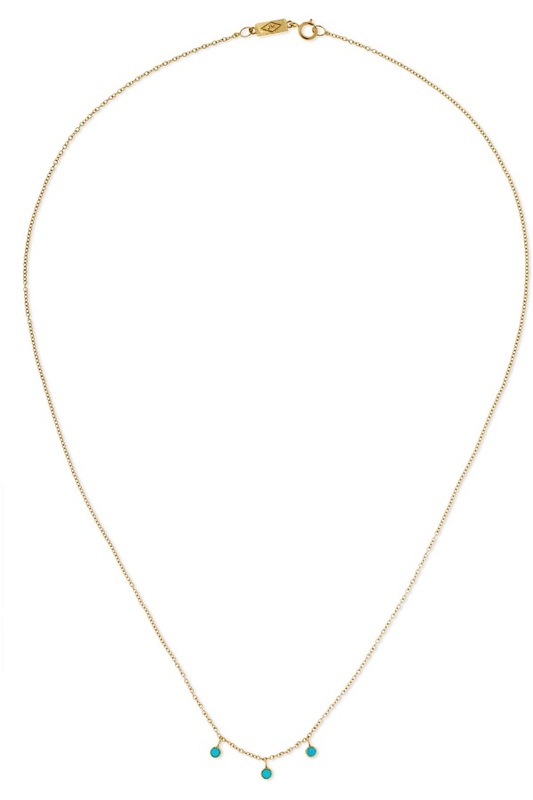 Anne suggests Meghan's could be the Jennifer Meyer 18 Karat Gold Turquoise necklace. A closer look at the piece on Meghan. In case you missed Her Majesty's Christmas speech, the monarch reflected on personal celebrations throughout the year: "It’s been a busy year for my family, with two weddings and two babies – and another child expected soon. It helps to keep a grandmother well occupied." The Queen focused on the importance of respecting each other and overcoming our differences: "Even with the most deeply-held differences, treating the other person with respect and as a fellow human being is always a good first step towards greater understanding." Indeed, the Queen's wise words could be applied to royal watching. It's my hope we'll see a kinder royal community emerge in 2019. Hope you're all enjoying a wonderful Christmas with your nearest and dearest. I noted over on Duchess Kate, I've been reminded it can also be an incredibly painful time for those who have lost a loved one or know someone grieving. Sending good thoughts in particular to those who find it a trying period. With sincere apologies for the lateness of the post and a word of thanks to those who have been in touch. I've been under the weather for the past couple of weeks and relapsed on Christmas Eve. Thankfully, I'm finally on the mend. Thank you all for bearing with me during this period. Sorry to those of you who were checking in yesterday for a new post on the service. I expect normal service to resume from here on in. First of all, I am so relieved you are okay. You are usually so quick with your posts and I checked this page and MaM all day yesterday and when I saw nothing I was worried. Health comes first and take as much time as you need/want as I've been suffering from a nasty persistent virus too over the holidays and every time I think I'm getting better I get worse. Quick hits on fashion: a miss for both Kate and Meghan IMO. I HATE KATE'S HEADBANDS. I cannot repeat it enough. I hate it. It swallows her face and makes us not look at her gorgeous hair. I know Anne Boleyn wore them and from the portraits they looked fetching on her but Kate is matching those headbands with very modern dress, and it just looks costumey. I liked her red coat. I will never be a fan of how she often goes "off-matchy matchy" by wearing three different shades of the same color wheel. In this case, there was a mauve headband, a red coat, and burgundy shoes. Match completely, or go for some color contrast. 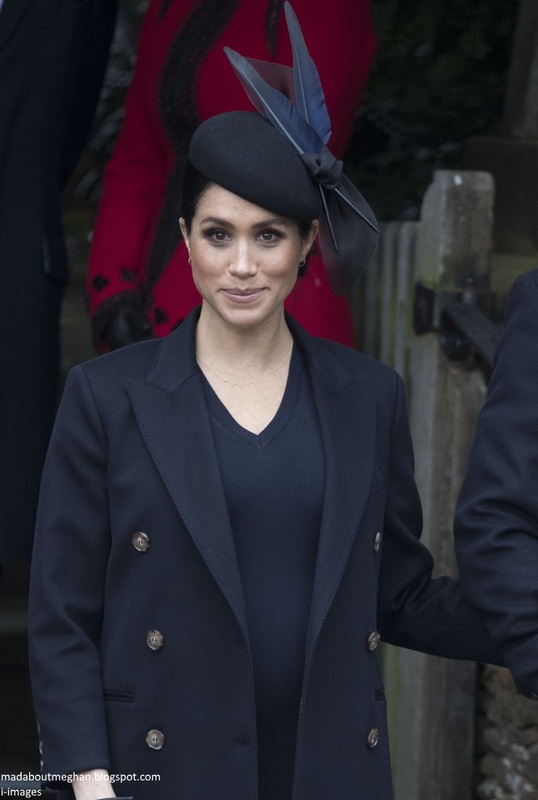 Meghan had a different problem -- she seems to veer between too-tight non-maternity clothes and wanting to swallow the baby bump with heavy layers. Yesterday was a "let's just swallow this baby bump." The overly boxy, baggy outfit wasn't flattering. Like her boots. The best dressed was HM. That outfit is perfect -- at 92, she seems to have embraced flirty, fun fashions? The pink trim on the beige coat is just the right degree of festive. But can we talk about how much the world needed to hear HM's Christmas address? What a soothing, wise address where she addressed important issues in a tactful way, like a real leader. I love how she mentioned the human capacity for good but then mentioned the dark side, the "tribalism" it can bring. I can guess at what she might be referring to but I'll leave those guesses to myself. The personal tone of the address was also a huge difference from the days when she avoided looking directly at the camera and used the royal "we." Loved her mentioning the changes in her family the way any matriarch would. But mostly her plea for kindness and respect is something EVERYONE can take to heart. I'm cross-posting this as MaM. Happy holidays everyone! I was so worried too! I was too! So glad you are okay!! I love reading your posts although I don't comment often. Health needs to come first. Please rest up and take care of yourself!! Glad you’re doing better, Charlotte. I hope everyone had a wonderful Christmas. Meghan looked nice but I didn’t care for the outfit. The individual pieces were good but I didn’t like them together. Very glad to read you ste on the medical end. Charlotte. We knew something wasn't right when you weren't up with a post right away. The universe is back on its axis now! It's my new phone!! I'm actually very glad to read Charlotte is on the mend! Thank you for the lovely posts both here, and on Hrh Duchess Kate. I always enjoy the amount of detail you include. I think they all look lovely, even though some pieces aren't my favorite. Meghan looks fantastic - I think the minimalistic look is a great one for the later months of pregnancy. Kate looks so good! The cut of the coat is super slimming, and I can see why she would want more than one color! Not a huge fan of the hat band style - seems so old lady to me. But maybe she'll be successful in renewing the style! Merry Christmas to you and thanks again for such a high quality blog! So relieved that you are better, Charlotte!!! I thought Kate and Meghan did a great job of showing a united front. I cannot believe that Kate would be mad at Meghan and/or be ugly to her, so I hope that their efforts to show us otherwise quiet the nonbelievers. I loved what Meghan wore because she is supporting VB, who is having a hard year. I like the coat and shoes in particular. I thought the hat was excellent. The earrings are hard to see. I found one photo where the little bits on the necklace did look like turquoise; perhaps it was a present. I thought Meghan looked beautiful without trying to outshine anyone. And in addition to her little touch on Kate, when the royals are all going into the church, there is a time when Meghan reaches out to touch Eugenie, who reciprocates with a back pat. I never thought I'd welcome a time when just the Markles in America sent ugly messages. But I think we should stop blaming Meghan and Kate. Wives of brothers rarely feud or row. They just aren't in each others' daily spheres enough to do so. But brothers feuding ... that stuff is deep and very thorny and hard for anyone to fix. I agree. The tension seems to be more between the brothers than Kate and Megan. The women seem to be working hard to bridge the divide. So happy to hear you are on the mend, Charlotte. Thank you for your wonderful posts, as always. I doubt William had his eyes on that role. It is a long-term appointment. William will soon enough have his hands full as POW and Duke of Cornwall. Charlotte, I was thinking you were taking the day off for Christmas, which I thought was great. Glad to hear you're feeling better. I disagree with Ivy about the headbands. I love them on Kate. Too bad about Meghan's dark dark outfit for today. Funeral wear, I thought, not Christmas Day with the Queen. Tired of the dark dark dark colors. She looks great in bright colors. Sophie's coat was beautiful. Noticed the distance between Harry and William. Charlotte - I was wondering if something had happened to you when we didn't get your usual very timely post. I'm sorry to hear you've been unwell and hope that you are on the mend. Take good care of yourself!! You are so right as well, that holidays (and birthdays, anniversaries, etc) can be very difficult for those who have lost a loved one. Sending good vibes to all of my MadAboutMeghan friends who may have had a difficult holiday...or just anyone who needs a virtual hug. WRT Meghan, she looked amazing, IMO. From the feathers on her hat to the tips of her boots - and everything in between - I loved it! The fit was perfect, she looks gorgeous in navy, and she looked sleek and modern. She is absolutely glowing and I loved her outfit. I don't know if it's pregnancy, being a newlywed in love, gaining back some of the weight from her pre-wedding (father) stress weightloss, or it's just her natural glow (or all of the above), but wow, her skin and the twinkle in her eyes are gorgeous. I think part of it is also that she always looks so engaged, happy, and like she's having the best time (thinking now about her visit to Brinsworth House and how she looked like she wanted to stay all day but kept getting moved along by the director). I also love how she keeps running into young women that she had inspired online - and how excited she is to see them! 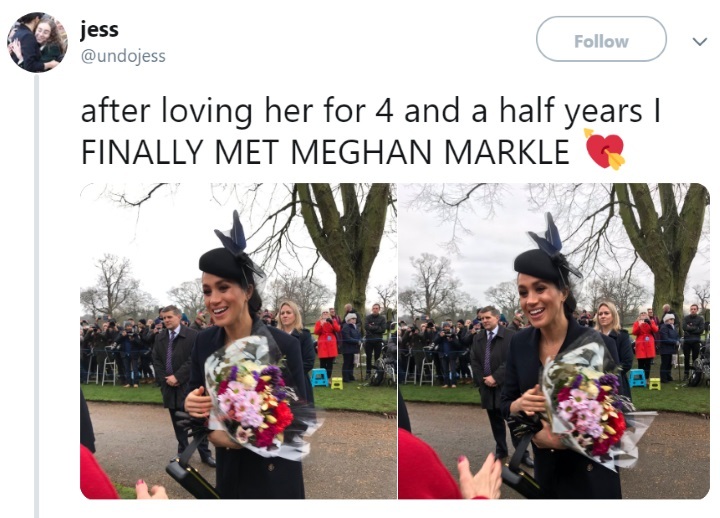 That must be so exciting for them and for Meghan as well to briefly reconnect to people she knew before becoming a royal. Charlotte - do you have any sense of when her patronages will be announced? I'm hoping for early January (well, I had been hoping for last quarter of 2018, after the tour...but that wasn't to be) and further hoping she'll make a couple of visits to all of them before her "spring" due date. Do you have thoughts on timing? I was worried about you, Charlotte...this has never happened? I wish you all the best!!! Take care. What a lovely post Charlotte, thank you so much!! I would like to add my voice to those who wish you a speedy recovery and wonderful health in the new year! First, I'd like to start out by saying that I thought Lady Louise looked quite lovely yesterday. The monochromatic colors added a bit of maturity to her outfit while being completely appropriate for her age. As I recall dressing a young teenager can be quite tough, sometimes they desire to dress a bit "older" than they are which can make it difficult for the parent who wants to respect their wishes while still wanting to preserve their childhood. Secondly, I loved HM's dress and coat today! It was so festive without screaming Christmas and the fuschia accents really brought out her lovely complexion. She really looked great in this outfit didnt she. I think it's very flattering too. Her posture is making me want to take up yoga if this is what it does for you! Lauri, I noticed Lady Louise as well. She must be taller than her mom now. She looked lovely. HM's dress and coat were splendid. Really loved her hat - so festive. Charlotte - so happy you're feeling better. I thought maybe you had computer issues. Anyway, lovely to see you're doing better. And the girls were definitely the buffers for the boys. I really do wonder what is happening - siblings will have riffs - so maybe this coming year, they'll let bygones be bygones. Glad you're feeling better, Charlotte! I'm glad you're okay Charlotte, I was slightly worried too. Fashionwise, everyone looked lovely in their own style: classic Kate, more modern Meghan. I also liked how happy Zara and Mike are, they so deserve it!! I was worried as well and hope you will care for yourself during your recovery. Loved the looks. Lady Louise is nearly as tall as her mother and what a lovely style. Loved Kate's outfit finding it very retro and feminine. Initially thought Meghan was wearing black, but I do love a dark rich navy blue. Glad you're ok Charlotte! Thank you for always being magnificent! Iim so relieved charlotte i think They have are not rift Or misunderstanding people i think that the media made that up I love whateverthe duchess of sussex outfit hmm i hope meaningful christmas To you and happy new new year to you . They all look splendid :) Happy holidays everyone! Charlotte, hope you feel better! Thank you for the wonderful post. I just found your blog a few days ago- thank you so much for all the work you put into it! It's wonderful to be able to read all the details without having to wade through all the negativity.Ive been having a great time going back and reading all the previous posts, both here and on the Duchess Kate blog as well. Again, thanks so much! Meghan looks great. A very polished and sophisticated look. The purse is gorgeous but having used similarly designed pursed they are actually not very practical and somewhat awkward to actually use and carry. But love the style of it. I really like the hat. You were dearly missed on Christmas morn. I among others are happy to know that you have taken a turn and are on the mend. Glad to hear the next royal tour to the USA and Canada is not until months after Baby arrives and you will have plenty of time to get back on your feet before a repeat of "Keeping up with the H&M" begins again. No way to know for sure but I do not think it is the turquoise necklace it looks like either gold "beads" or maybe tiny diamond chips. But very delicate. I love the necklace! 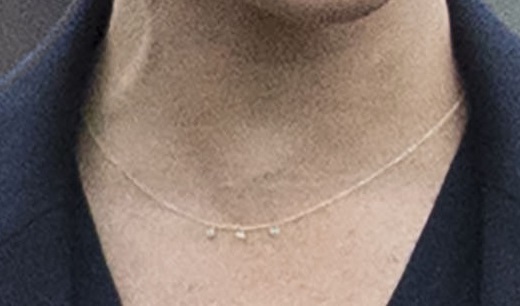 Meghan’s jewellery pieces are so fine & delicate (sometimes you can barely see them!) but they are always lovely. She has really good taste. Glad you are on the mend Charlotte! I think Meghan’s accessories are the winning parts. Love the unique hat and purse shape. The coat and sweater dress are a bit dull, but she still looks lovely and glowing. I know Meghan prefers solid and dark colors. But I have a theory. Both her looks have been very toned down for last Christmas and this Christmas. Her neutral tan to Kate’s bright tartan last year and her dark navy to Kate’s bright red this year. I was curious if Meghan is making a conscious fashion effort not to try to upstage Kate? I wonder if they discuss fashion selections beforehand? I think a lovely forest green could have been a little more festive for Meghan. But regardless she always has glowing skin, a bright smile and sparkling eyes to make up for her minimalist color schemes. Excited for her patronage’s to be announced in the new year! Glad to read you're okay ! Like others, I was a bit worried. Get well soon ! glad to hear you are on the mend very sorry for your loss it was weird going to another source for my meghan and kate christmas fix! i loved her majesty's message. eugenie looks lovely and meghan looks chic i love her hat but i prefer catherine's stunning outfit although meghan's is more practical and i would wear that one more myself. Glad you are ok Charlotte. I appreciate your words about loss & sickness. I'm not sure if the comment about loss was personal or general, but it resonated with me, as we just buried my husband's younger brother at Thanksgiving (leaving a young family behind/cancer) so while I threw myself back into work, I found myself lacking all Christmas spirit this year & was forcing myself through the motions & looking forward to 12/26. That said, with the pressure off myself, I was able to enjoy our whole extended family being together. We also had been stricken down with that cold virus that has been going round (many of my friends & colleagues in London have had it too) but it just dragged on & was the worst. So if you had that Charlotte, you're a trooper to even get this post out! I want to thank you for another year of incredible blogging & look forward to the excitement of meeting Baby Sussex in 2019. Merry Christmas to all of my DKB & MAM Family here, I truly treasure you all. Hard to believe that some of us have been together now for going on almost 8 years! Sending Blessings & Wishes of Good Health to you all! Loved reading everyone's posts thus far. I have to admit to loving the red/navy complimentary color scheme between Both Duchesses. I thought they both looked lovely & I am a full-fledged member of the Kate's hatband fan club! (tho I'm not sure we have a large membership) :) I especially love this one with it's unique pill box hat nod & the lovely bow detailing in the back, as well as how it sits on her head atop her lovely long hair. Meghan is simply glowing & I just love her in navy! Beret looks are not my personal favs on anyone, so there's that, however I do love the feather detailing! It's striking! The Queen.... well she is just a wonder! I loved her outfit & just relished & treasured her Christmas Speech! She seems the Queen/Matriarch to the world & why not. She's been a part of the world stage since before WWII & a living breathing part of world history for 9 decades! She also is the one person who could rightly give us all a dressing down when needed! I think the world needs to listen to & take to heart all that she has to say & the wisdom she has to bestow on us all! She has lived in the past, navigates the present & likely has a strong sense of the future! She is a global treasure! I wanted to share my thoughts on the brothers. Being a mother to 3 grown sons, I've given this a lot of thought. I believe what Will & Harry are going through was always going to happen & they will find their way through it & hopefully (if they are not too stubborn) will come out the other side with a new sense of themselves & the ability to respect one another in their new roles. It's not a sure thing, but I hope it will happen. We all have seen their differences since they were growing up as little boys & they both had different destinies! We are now seeing that all come to fruition! It was easy for them to support each other & be mates, while they were young men growing up & clowning around. Harry supported William with all he went through while dating Kate & then showed his support as William married "a commoner"! (how silly all that "to do" was upon looking back on it!) Then Harry had his tough years & William & Kate were there to support him. They sort of fell into the rolls of Will & Kate & Harry tagging along. As Harry started pursuing his own causes (i.e. invictus etc) it was all nice & William of course supported him & everyone wanted Harry to find happiness. Well now Harry has come into his own, he really owns who he is, including his dynamic presence & he's married to an equally passionate partner & has his first child on the way. He's become his own man! Then there is William who has truly now stepped into his role as Prince of Wales in waiting & has shifted his whole dynamic (same as kate) they are full steam ahead & he appears to already have put on the mantel of "Future King" & Head of The Family...... knowing this will be his destiny! Very insightful Becca, I believe you are correct. And, given time, I hope they are able to work it out and as you said, come out the other side with an even stronger connection and relationship. In the interim, we can only hope the media and various commentators will let them do it in peace and privacy. Becca, for the most part I agree with you. Adding a fourth person to the mix was bound to create some issues as everyone adjusts to the new dynamic. That being said, IF William did tell harry that meghan wasnt a good choice,that was not a smart move and he perhaps overestimated his influence. When my sister married her first husband none of us liked him and we thought she was making a huge mistake. We did not say a word because there's not much more you can do to push someone away than tell them their choice of spouse is a mistake. That's where i think things went wrong if that did happen. William should have checked his ego at.the door and allowed his brother to make his own choices with no Interference. If he is right harry will find out soon enough, and William has now made harry less willing to approach him if that does happen. The best William can do now is apologise and wish his brother happy and give his most fervent wishes for their marriage and new family. Very interesting POV, Becca, and I think you could very well be correct. The only thing that puzzles me about this tension is that these changes Harry has gone through are all good and exciting, so I'm wondering how tension could arise from it at all? In my opinion, by the time William makes it to King (if the monarchy is still a thing by then), I can't imagine that it would be the same kind of monarchy where Harry would really have to be subordinate to anyone. I could be dead wrong, though. And perhaps they're just struggling because they've finally reached different phases in life and for the first time don't have to rely on one another. I agree with you 100 percent, they are grown and settled now, it’s time for them to have their own lives, it’s the natural way of things. Becca, i see your movie you worked on, Mary, Queen of Scots, is out for viewing. It must be so special for you to see all the hard work come to this point...for all to see and enjoy. Best wishes for a successful movie. I like every bit of Meghan's outfit, especially the gorgeous coat. But it's not very Christmassy....A scarf might have helped. And may I add my get well soon wishes, Charlotte. Happy to hear you're on the mend, Charlotte! It's quite debilitating to be sick at Christmastime. 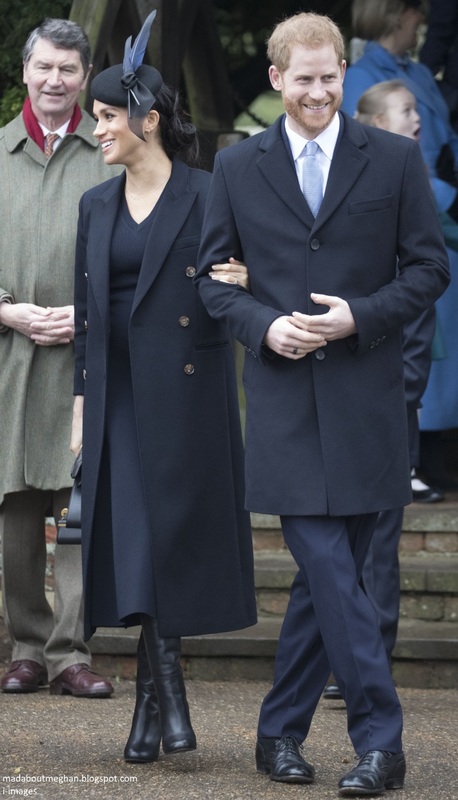 Meghan's dress was a hit for me, especially during pregnancy, but my quibble is with the coat being unbuttoned. It simply looks messy. A wrap coat would have 'showcased', if you will, the growing bump, and not sacrificed warmth. I also don't understand holding gloves. Either wear them or put them away. Finally, I'm not a fan of 'head to toe' designer dressing--it reveals a lack of confidence or originality, or worse, a walking advertisement for a designer. Meghan is very good at styling herself, and I hope that she will forego wearing every piece from a designer at once. Finally, I believe the Autumn Phillips looked absolutely stunning in green. I agree with your assessment of Will and Harry -- Harry "needed" a hopefully guiding steady hand for so long but now he's emerged as a very capable and successful spokesperson for the monarchy. I think they will get closer again as time goes on. I was wondering what will happen, for example, when the Queen no longer provides the gathering point at Sandringham. Will Charles have the whole family with him at Christmas or just his children? The two young families will have less time to be together, but as their children grow, I bet Will and Harry spend more time together again. I think Meghan likes more of a open coat or over the shoulders look. I’ve followed her for years in Toronto and rarely has she been photographed with her coat all buttoned up. I also think it could be a style issue between North America and England as we don’t wear coat dresses like Kate and the Royal Family do for weddings, events etc. Either way she can’t win as she would be critized for buying a maternity coat from VB. Thanks for everything you do Charlotte! Happy Holidays. Personally I also wear my coats unbuttoned, but then I don’t get photographed from all angles. I think it might be less of a cultural thing and a more a case of the royal ladies realising that a buttoned coat photograph well from all angles while leaving it unbuttoned give you some good pics and some where you look very sloppy. If that is the case I suspect we will see Meghan buttoning her coats after a while. She is after all a clever woman who understands the value of managing you image in the media. Charlotte, I am so glad you are feeling better. I enjoy the blog but your health is more important. The Duchesses look lovely. Very good to see, yet another young lady, inspired by the Duchess of Sussex. No matter how people try to bash her and shame her, the goodness she does shines through. PTL! The Royal Family gave a united front with all smiles and happy faces. Already some news outlets are trying to start another angle of the Queen “telling the Duchesses to get along”. This is becoming such a boring narrative and I hope everyone in ‘media world’ can move on. I agree with you, Charlotte; looking forward to a kinder Royal community and WORLD. I think the cut of Meghan's coat and dress are great, a very elegant look overall. However, I do wish there was a little holiday color instead of the monochrome navy for this day in particular. My go to holiday color is black with gold jewelry, that’s the great thing about clothes/fashion we all like something different and have plenty of choices. 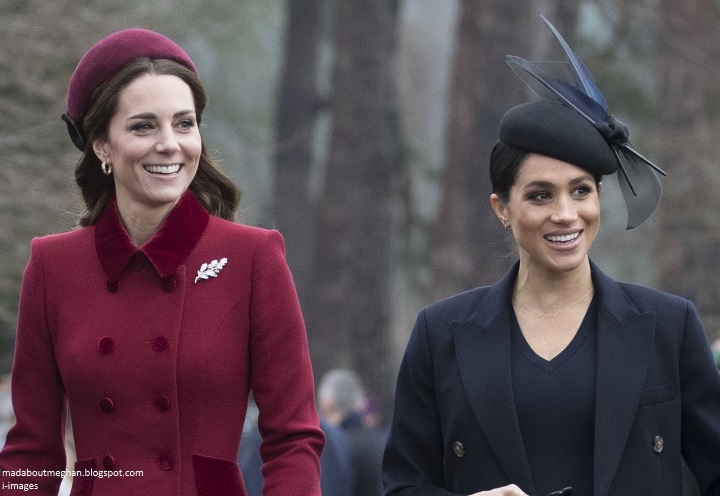 More dark colors for Meghan...she must feel comfortable in darker tones but it seems very blah, especially on Christmas Day. I thought she looked radiant in the pacific blue evening dress in Fiji and a bright red, or the green top and skirt she's worn in recent past would have been really stunning colors for this occasion! 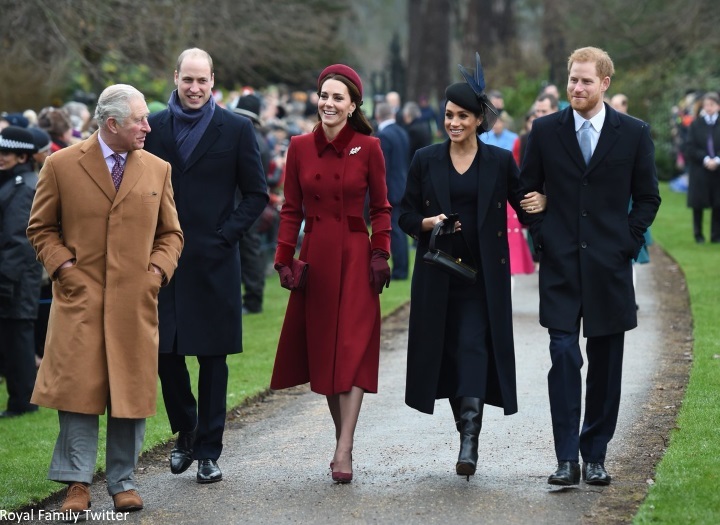 I thought the Wales family looked very much a family walking together to Christmas service. Sorry Camilla was not there to complete the picture. Kate and Meghan looked well-dressed, and were an elegant contrast to each other in style and colour. I loved Kate's festive look, and Meghan's elegant navy. Meghan's VB coat is beautifully tailored and suits her wonderfully, giving her a beautiful silhouette duriing her pregnancy. The glimpse of her dress suggests to me a lovely understated maternity dress. Interesting that Meghan would choose VB during pregnancy. I remember VB at Kate and William's wedding, very pregnant and in navy and tottering heels. Also, VB is criticized repeatedly by some for wearing navy/dark colors to weddings. In my world, navy is always appropriate. It is a wonderful neutral color in the blue range. I notice that all the Brits (Autumn, too in her wonderfully stylish green coat and is Canadian) are all buttoned up and Meghan is the only one with her coat unbuttoned. The coat is exquisitely tailored, and she looks just a nice combination of elegant and relaxed, without looking sloppy. In Canada, we frequently walk around with coats unbuttoned. It's just a difference in custom, just like for example, British women seem to wear their blouses completely buttoned, and American and Canadian women will generally leave the top two buttons undone. I notice that when Kate wears a shirt dress, it is completely buttoned up, but when Meghan wears one, she leaves the buttons undone. I assume she wore the coat open as it is not a maternity piece and would not button properly. She may not button up her clothes in general but in this case I assumed she could not have buttoned up the coat even if she had wanted to:). I read that Meghan joined the boxing day post shoot lunch. Jolly good. That is another rumour squashed. Thank goodness. She may not like to wear fur, but she and the rest of us wear leather shoes, boots and handbags, all derived from animals that had to die. Some of the food we eat was probably and sadly derived from animals who suffered. I think that we can minimise the harm we cause to animals by choosing our clothes and foods as carefully as possible, but at the end of the day it is not always easy to do so. Even "free range" might just mean the animals are let out for an hour or two every day. Is that ethical? Where do we draw the line? These are all big questions, and whilst very important, unless we all move back to a pre-20th century way of life, we probably won't tick every box every time. I personally will continue to try my best, and I am sure that Meghan tries her best too. To summarise, she might not agree with hunting, but she did the right thing by supporting her husband, and the rest of the royal family in partaking in this day. I think Harry passed on Boxing Day last year, but that may have been to be with Meghan. I agree that if she wears leather and eats animals, there is no reason to skip this outing. The birds had a good life before they were shot, which is better than most animals. And much better for the rumor mills to have attended! I believe Harry had to return to London for something work related. That is what I read anyway. Nothing was mentioned about Meghan having anything to do with it back then. Happy to see you're on the mend, Charlotte. I was worried! I love seeing Meghan and Kate providing a united front (even if it does seem a little overdone...I'd probably do the same in their shoes). I also love this opportunity to see their very distinct styles. Meghan looks so chic, although I do wish she would've worn a little bit of red or green for the season! I don't like the tall boots with the long coat and dress, but that's a minor complaint. I went back and watched the videos from last year's Christmas service and Harry and William were very much laughing and talking together....at first, I thought that they were just busy walking to church, this year, and simply weren't feeling talkative, but after watching the videos from last year, it does seem like there's some tension. And seeing Kate and Meghan walking and talking together, it really doesn't seem like the tension is coming from them at all. I agree with those who have said it seems to be the brothers who are struggling. Working so closely with family would be really hard. Remember William at the Royal Foundation Forum when he laughed and said they definitely have differences of opinion when making decisions, etc? Perhaps this is just an example of that. I think this is the first time that neither William nor Harry are needing to rely on the other so heavily, as they both have wives (and families) now. That in itself must be a difficult adjustment. Then, throw into the mix the roles Harry and Meghan are carving out for themselves and you have a further degree of separation -- a natural one, of course, but still a change in dynamic between brothers. Hmm both my parents were the "babies" of the family. Both grew up with siblings that were as much parent as sibling. I can tell you that there was tension as they grew up and got married and had families and lives of their owns because their older siblings remembered bathing them, washing their hair, cooking for them, teaching them how to ride the bicycle. So they had trouble when my dad (very stubborn and outspoken) expected to be treated as an equal. My mom had troubles with her siblings too who still viewed her as a baby. Even though W&H are close in age I suspect for a long time there was a similar dynamic -- caretaker/mentor/older brother. The good news is ... after awhile age differences tend to fade and shared experiences bring siblings back together. The bad news is ... the tension did not go away overnight. And it still hasn't gone away completely ... my dad is still very stubborn and gets into arguments with his older sister when she tells him what to do. The thing is my parents got to do this privately. W&H have no such luxuries. They have to play out this dynamic with snoopers and the press and gossipers constantly. It can't be easy. I also think we need to stop blaming Meghan or Kate. In my experience wives rarely ruin a sibling relationship. They can add to the tension for sure. They can subtract from it. But whatever issues brothers go through is usually deep, thorny, and beyond the addition of another party. I really believe Meghan wore dark to allow Kate to shine, she absolutely didn’t want to be accused of stealing Kate’s light again...but I am absolutely not a fan of the Beckham’s... they rubbed me the wrong way when they announced they had applied for American citizenship and made the big move... which many have been waiting a long time for... then they announced it wasn’t a good fit for them. And of course they went to California....like it’s the only place in the US deemed good enough for them. They are showy people, and it isn’t American not to smile and make people feel at ease... Meghan is not gaining any respect by associating with them.... and supporting the fashion line, would probably be the very last designer I would purchase. Glad to see them out and happy together though, despite the failing fashion choices. Happy New Year ! Meghan's outfit is a smash hit, I love the most of the pieces, I don't like of the bag, I think the shape is strange, but like the coat open, it is undestandable for her situation, the color is hard do to indetify, i don't know if is dark blue ou black, only I see is feather is blue, but the rest I cannot to speak the same. As usual Meghan looks exquisite. Classic but totally modern, clean, chic, fresh and appropriate in every way. LOVE that hat, how beautiful! And her accessories are drop dead gorgeous. The boots, the PURSE-just stunning, understated style! Glad to see that you are better, Charlotte , while checking posts on the 26th I did think you were not feeling well, it is quite often that we relapse, I did and some friends did too .... no need to apologize, we so much appreciate your posts and the quality of you work , we all think you deserve some time for you and Mr Charlotte and’ family and friends ! William and Kate have a different role than Harry and Meghan. As the future king and queen, they have to be more formal and traditional in their approach than Harry. I don't think anyone is jealous of anyone else and no one needs to change how they do things. As ali says, they all are just fine. You may have been influenced by recently published articles in the tabloids and drawn too hasty conclusions. I think that they are all doing fine. Harry is a married man and of course the relations between the brothers are no longer the same. They all have to adjust. It may take some time but it is natural. If we could only discuss sourced material the comment section would be dead. Less full, perhaps, but I don't think "dead." There would still be opinions based on personal observations. For example, opinions on the use of numbers of engagements performed as a measure of the impact of a royal's service and therefore the value of that service and by extension, the value of the royal. There are writers who have written hundreds of items but their impact is negligible; in contrast, there are others who have written fewer works but have had great impact. Harriet Beecher Stowe--"Uncle Tom's Cabin." Numbers by themselves are meaningless. See. Not a single tabloid reference but still, I think, a worthwhile topic for a royal blog. Using only properly sourced material might mean fewer comments, with comments based on reliable, named sources and facts instead of half-truths and sometimes outright lies. If a comment section dies from lack of repeating fabricated stories- maybe that would be a good thing. That won't happen here as there are a number of commenters interested in intelligent, rational discussion more than the repetition of unsourced material. I have no doubt that William and Harry are going through a very serious period of personal transition. We all need to be very careful and wary of reading too much into things or taking media articles about the "tension" at face value. I think William may actually be going through a period of grief right now, with the changes in the dynamic of his relationship with Harry. Grief is not solely about the loss of someone through death. It can come with any loss or transition. William has had Harry to himself for a very long time and now he's having to share that relationship with Meghan. I suspect Harry went through something very similar when William married Kate. This does not mean that William is angry or bitter about Harry's marriage to Meghan. But, it does mean the loss of how their relationship worked and thrived before. Add to that, William's very protective nature of Harry, and he may be feeling like Harry doesn't need him anymore. That loss of being needed in the same way can also be very jarring and prompt grief. I believe they will work through this transition in their own time and hopefully it will make their relationship even stronger. William has always been the more cautious and reserved brother and Harry has often been more impulsive and outgoing. But, both men are thoughtful, compassionate, good listeners, empathetic, and passionate about helping others. They have much more in common than they have differences, and those commonalities and shared values can help them through any personal transition. Patience, time, face to face conversations, and understanding will help the most. The dynamics of relationships cannot remain the same forever. They must evolve and change when the need arises for new direction and growth. Very well said, Sarah! I agree with you and would only like to add that IMO the same/a similar thing happens whenever a new member enters a family, be it a newly married-in member, a newborn baby or a newly adopted sibling etc. The outfit is nice, but not festive in nature or remarkable. I found the cost of the entire ensemble the breath-taking part. I really don't understand how H&M can see this level of wardrobing as relate-able or in touch with the initiatives they are supporting. Sorry folks for me this is part of the fashion choices made and the connection they want to establish. It's because being sensitive to the situation is part of being compassionate, aware and increases the possibility of being taken as creditable. This event was not one of those occasions but I'm trying to make a general point. The palaces weren't built yesterday and aren't going anywhere. The Royals are trying to transition themselves so yes what they wear matters because it's a simple thing they can do every day. All four of them commented on the dynamics of their relationship, and acknowledged a hint of the truth at the Foundation’s meeting. They are four different personalities. After all the commentary from tabloids and some reliable sources, what surprised me today, is BBC’s editing of the wedding ceremony. As recently as last weekend the bride and groom singing the national anthem, “ God bless our precious Queen…” in St George’s chapel, Harry saluting to the Queen as their procession passed by the BRF, riding the carriage through the long line of the crowd had been a part of the BBC video. Today, all that is cut off/ edited out from the BBC video (except unless there is a long version and a short version of it.). Something is not right somewhere; those insiders know well. The general media and the public know the surface rumors only. What they edited is very significant parts of the wedding highlights which translated the Queen's presence, approval, the couple / especially the new American bride singing the UK’s national anthem, and the jubilation of the crowd. BBC is more of an insider in my opinion. By deduction, as if to say, it is the couple’s wedding, and the edited part is not as much a part of it all. After considering this for a couple of days I have a slightly unusual theory. Everybody knew beforehand that a “we all play happy family” walk will convince nobody that there are no tension. We also know that both brothers are extremely protective of their wives. The church walk might not have dispelled the tension rumours but it did shift it away from Meghan as the source of the tension between the brothers. I have a suspicion it was done on purpose. William has acted as a decoy before to protect Kate and people are still forming an opinion about Meghan so she has most to lose if the Duchess Difficult narrative continues. While it is difficult to stop a story altogether, redirecting it is much easier. This is off course purely speculation but I often feel that the BRF often allow the media to go with an angle (of their choosing) to prevent the media from digging too deep into other angles. I wonder if the Sussex children will be prince and princess. I thought they would because prince Charles their grandfather will be King. Do you think the queen will amend the rules to allow the Sussex children to be prince and princess. The queen amended the rules on December 31, 2012 to make all of the Cambridge children prince and princess. I wonder if the queen will release one tomorrow? Fingers crossed. I think the rule is great grandchildren of the monarch are not styled prince/ss which is why the cambridge children were given that styling by the queen. When the Wessexes got married, at the same time their title was announced it was also announced that their kids will be styled as the children of an earl and not HRH. The fact that nothing was announced at the time of the Sussex wedding makes me believe that nothing was decided yet. I am sure H&M wanted to carefully consider all the options and the effect it would have on their children. I don’t envy them the decision. Wednesday. Reason for that is they are styled earl and countess. I was surprised they aren't prince and princess like Andrew's children. The Dukes of Gloucester and Kent are grandchildren of King George V. They are Prince Richard and Prince Edward. Their children are not prince or princess. Princess Margaret was a granddaughter of King George VI, born second in line to the throne. Her children also are not prince and princess. Surely Prince Harry’s children will not be, either. His oldest son will inherit his dukedom. His other children will be known as Lord and Lady. Well said, Patricia and completely accurate & factual. Titles are inherited from the male line. Margaret was a princess as her father was king. She was female so her children were styled after their father. Same with Anne. Her children dont have titles as their father didnt. Princess Margaret Rose was the daughter of George VI. Her husband, a commoner,was given an inheritable title by the Queen which allowed Margaret's son to inherit his title upon his father's death--Earl of Snowden. Margaret's daughter is called "Lady" Sarah Chatto because of her father's bestowed title, not because her mother was a royal princess. Daughters of BRF monarchs cannot pass titles to their children as "Princess" is not an inheritable title. As bluhare says, (royal) titles are inherited from the male line. I believe there have been a few examples of daughters of aristocracy inheriting a title when there were no sons in order to keep the title and entailed property in the immediate family. I believe this was done in the will of the deceased aristocrat but I am not sure. Correct, bluhare. I have said this for years about the reason Anne's children did not have titles. Their father was a commoner and was not given or chose not to receive an inheritable tile from the Queen. On the other hand, Eugenie and Beatrice's father is a son of the monarch and as such, his daughters carry the title "Princess." I think it is unfair that Beatrice, as the older child but a female, cannot inherit her father's title, Duke of York, and thus pass to her children. Because of this the title will revert to the Crown on Andrew's death. The Queen (as Monarch) is Duke of Lancaster, after all. Women can be Dukes. Beatrice will always be a Princess but her children will take their title from their father. Same for the children of Eugenie and Jack. Same for Zara's children, and so on. I am not sure how the new laws of succession finally ratified before William's first child was born affected royals other than Charles the heir's family. I know it was not retroactive. I think the only immediate effect is that Charlotte will take precedence over Louis in terms of succession to the throne; but she will not, however, proceed Louis as heir to her father's Duke of Cambridge title. This seems strange to me and somewhat illogical. Regarding Harry's line. His oldest son will inherit the Duke of Sussex title but will be called "Lord...." until then. His daughters will take their calling from his position as Duke, not from his title of Prince. Anon 2 January 17.52 very clear explanation ! So a difference must be made between titles that can be inherited (ie earl os Snowden) and titles that can be granted (ie Prince of Wales’, which is the usual title of the heir to the throne and is granted by the Queen, Charles has been styled so when he was around 8 years old, if I remember well) . I thought the dukedom of York was the title of the second son of the monarch , but seeing what you wrote, I am not so sure . Really interesting ! Thank-you, Nicole. You are correct. Historically, second sons have been called Dukes of York. HM's Father- a second son, later George VI, was DOY when his daughter was born. I think the Queen probably chose the title Duke of York for Andrew exactly Because he was her second son. Actually, Prince and Princess are not titles. You are either born one or become one by the monarch's designation, but the rank (?) cannot be inherited as titles can be. For example, QEII gave her great grandchildren by William the right to be called Princes and Princess. I still don't know who will inherit William's Duke of Cambridge title when he becomes POW, if anyone. There must be a precedent somewhere. It is inheritable, I think, just as Duke of Sussex. If William's children are still not of age when he becomes POW, the title will revert to the crown, I believe. 17:52. So glad you are coming around Charlotte - I hope you make a speedy recovery. I very much enjoyed this post, as I always do, and feel very fortunate to have found your blogs shortly after you started the one for Duchess Kate. They make a lovely way to start (or finish!) a day. The streamlining of the monarchy, as Prince Charles calls it, is tricklingbdown to the next generation. Just like the Queen putting all the focus on her first son and his children, as evident from the Wales family portrait on the Queen’s desk Christmas Day. So shall Prince Charles carry on his desire for streamlining once he becomes King - surely, a portrait of the Cambridges will be on Prince Charles desk at Christmas, without a portrait of Prince Harry’s family insight - there were nit any visible photos if the Queen’s other Children during her broadcast.mSuch is the way of the Monarchy, with the senior royals, the direct line, being the main focus. I think that for many years people have lumped William and Harry together intheir minds without realizing that one is a senior royal and one is a minor royal. It is not so much that a split in their relationship is now occurring, it has been a divide that has been present since birth, it in onky now that the change in monarch is nearing that it is becoming evident to the public. William and Harry have been aware of their drastically different positions and roles on the monarchy since birth, so it is hardly unlikely that it is causing any sort of riff or feud for them now. It is just the public’s reaction to the nearing change that is causing the media frenzy. He is not a minor royal. As Anonymous said if the streamlining means that the focus is on the monarch, the heir and the heir’s children, it does mean that Harry is a ‘minor’ royal. Prince Edward is a good comparison. He is the monarch’s son, he does a huge amount of work in the firm, but he is not the first person you think of when you think BRF. Harry is not minor in the sense there are expectations re: royal work for him under QEII and there presumably will be under Charles as monarch as well. In return, Harry receives royal "perks" other grandchildren of the Queen do not receive. And in that sense of the term, Anne, Edward, & Andrew aren't minor royals either. Whether or not they were in visible photos during the Queen's speech, they do a great deal of royal work. But like those 3 children of the Queen, Harry *is* minor in the sense of the order of succession especially now that Will has children. It's that sense of being minor that Harry has grown up being aware of in one way or the other. The reality may be hitting home in a different way now but he's always been aware of it. I agree. It will be decades before William's children carry out royal duties. Charles is the next King! People seem to forget that! It will e decades before William will be king. Until then, Charles has Two sons who will assist him. Harry will be a senior royal assisting BOTH his father and brother for decades to come. Yes. I consider children of the monarch and prince of wales senior royals. Children of other siblings are not Harry's children will be less senior than he is vis a vis Beatrice and eugenie. Thanks for the reply, bluhare. It appears different definitions for "senior royal" are being used by different people. "Senior" status determinants seem to run the gamut from financial support to popularity, including popularity in the US. My definition, a definition that wasn't intended to be derogatory towards Harry, was much more narrow when I said he wasn't in the senior group. I certainly consider Harry to be a full-time working royal as are all the Queen's children and Sophie Wessex. And he does receive direct financial support and other benefits from the Queen and the Duchy through Charles. Beatrice, Eugenie, Peter, Zara, and the Wessex children, while just as much beloved grandchildren of the Queen as Harry, aren't working royals, obviously. Financial benefits they receive don't generally come to them directly from Crown funding/holdings but are passed on by their working royal parents. In my way of thinking, one can't be a senior royal without being a working royal, but being a working royal doesn't make one senior. For example, we don't see Harry OR the Queen's children (except Charles) attending state dinners or diplomatic receptions these days. To me, only current senior royals attend those. Perhaps when Charles is on the throne Harry will attend those affairs. Because membership in the senior group is fluid, he would then be considered a senior royal. But that doesn't make him one to me now anymore than I'd consider future king Prince George a senior royal right now. Hi Lizzie, most of the Queen's children do attend state dinners they just aren't photographed in the same way as W&K. Here is an interesting take on the whole senior royal debate. I actually had no idea all the Queen's children currently attend state dinners, Lauri. Thanks for the info! Do they also attend the diplomatic receptions? Interesting article too! Shows there isn't an agreement on how to define senior royal. I'm not too sure about the suggested definition in the article though (counselors of state plus spouses.) By that metric, when the Queen passes away, assuming that happens before George is 21, Beatrice will become a senior royal. Certainly she will become a counselor of state so maybe that makes sense? Of course, one could easily argue and I suspect Andrew has, that means she ought to be a working royal now! May you have a healthy, happy, prosperous and A Very Happy New Year. Happy New Year, Charlotte! Thank you for all you do! A very happy and prosperous new year to you and yours, Charlotte! May it also be interesting and full of great experiences. A very happy new year to Charlotte and everyone who are members or readers here! I wish a fantastic 2019 to the Duke and Duchess of Sussex with many more to follow! Charlotte, I think I've only commented 2-3 times between your blogs, but I have followed your work since 2011. I have been so happy with your thoughtful coverage of Kate and was thrilled when you added a blog about Meghan. I am relieved that you are on the mend after having a difficult time over Christmas. I do not know the details, obviously, but I am well-acquainted with how difficult the holidays can be for people and your comments really spoke to me. There is often commentary about discussing mental health to reduce the stigma associated with it, and honestly the holidays are a challenging time for my family. My husband has depression, and Christmas can be a terrible trigger for him. If he was expected to parade to/from church with his family every year...well, he simply wouldn't, to be honest, so I suppose it's good he isn't in the RF. You give us so much with these blogs, and we are grateful. I hope you are taking care of yourself, as well. The press and followers on all sides are creating so much negativity these days. I can't imagine what you are sifting through as you try to fairly cover two women who the press and commenting world are pitting against one another. In particular, there has been so much outright or not-so-thinly-veiled negativity regarding Meghan. It must be daunting and intellectually/emotionally exhausting to review the comments on both your blogs and try to strike a balance where conversation continues without vehement hatred toward either woman, or racism toward Meghan. I enjoy following both these women as they lead their lives representing the U.K. monarch. I'm also built like Kate and enjoyed buying pieces like hers in the early years of her marriage. We had very similar taste in clothing at that point. I admit I have been disappointed in Kate at times because as someone just a few years younger than her (who as a kid daydreamed about marrying one of those princes if only I wasn't Catholic and American), I often compared what she was doing to what I would do if given her position. I'm an attorney whose job requires professionalism, an ability to engage with people from all walks of life, and occasional media statements, and that frames my outlook on things. I love meeting people, and if I were in the duchesses' shoes I would cherish the opportunity to meet/greet people all across the U.K. With my background, I empathize strongly with Meghan. I understand wanting to jump right in and do as much as possible. I hope if I were in her position, I would proceed cautiously and respectfully, but I can see how being eager can be perceived as being overzealous/pushy, and how having a strong vision can be perceived as being difficult, especially if it conflicts with your superiors' ideas. While acknowledging the need for some adjustments, I would not want to lose myself, because presumably my husband fell in love with me, not a mold of me created by his family that he hoped I would squeeze into one day. Meghan must be going through a very trying year of transitions and learning, particularly facing pregnancy and motherhood. I hope everyone gives her a chance. It seems like many royal followers have already written her off or refuse to give the benefit of the doubt. I find that very sad because I believe once she finds her footing she has so much to offer. I think she has already been a tremendous asset for the family, and I cheered her every step of their tour, often (though not always) thinking, "This is exactly how I would want to do things." Anyway, this has veered off my original topic, which was this: You give us all a tremendous gift with these blogs, and I so appreciate what you do. At the same time, I hope you are taking time for yourself if you are feeling stressed with the exhausting work of trying to keep a balanced tone for the people who, like me, want to read thoughtful articles and commentary about the lives of two women who are very different, but both very beautiful and special to us. May 2019 bring you peace and joy. Thank you so much for your thoughtful comment. It's always so interesting for me to hear from readers who don't comment regularly. I value the feedback immensely. I've always believed a good portion of readers are interested in the monarchy as a whole and the roles both duchesses play. Over the past year "Fan Wars" have come to the fore and it's been hugely disappointing to see commenters turn from sensible discussion to allowing this tabloid-induced frenzy to take over royal watching. The situation on social media is deplorable. I'm sorry to say it's the most ardent fans on both sides primarily responsible. The years ahead are key for the Royal family and it seems such a shame to see their work at home and abroad ignored due to the scale of the vitriol. I'm certainly hoping for a kinder, fairer and more balanced 2019 in the royal community. Charlotte, I am so glad you're feeling better, and I want to second everyone's praise of the incredible job you do. Your posts, while comprehensive and and so enlightening, as well as often visually enchanting, contain the kindest and most optimistic words. You are a lesson to me, for certain, to not let any negative suggestions creep in. I started reading your blog because I really liked Kate and was then fascinated by all the intricacies of her "job." We need to realize that these are real people tasked with what might be beyond-real jobs. It is so tedious to read one hateful "news" story after another, even though we know they're false. And the slant that is put on the action of each individual is also very irritating---taking simple "boring" facts, like Kate joining in the shoot, and styling it to be something she purposefully did after Meghan was gone. They take ordinary activities of these lovely women and try to make them sneaky or calculating. It's just to tiring and thank heavens you always keep a level and cheerful head!! Dear Charlotte, I hope you are feeling better and are enjoying the New Year!! I don't want to nag or push but will you be posting an end-of-the-year favorite fashion post for Duchess Meghan? While we all agree that the ‘chatting duchesses’ put on a good PR show for the media, it in no way really refute or confirm the ‘rift’, it does seem like it served its purpose. I am not so naive to think the media won’t return to the story, the frenzy that started when the move to Frogmore was announced, has died down a bit after Christmas.